Where do you find the most bells in classical music? In opera. Where do you find the lowest ones? In Tosca by Giacomo Puccini. The percussion score includes an E1, an F2 and a Bb2. 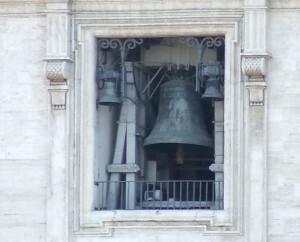 That E1 – the lowest E note on a standard piano – was inspired by the tolling of the Campanone (the big bell) of St. Peter’s Basilica in Rome. 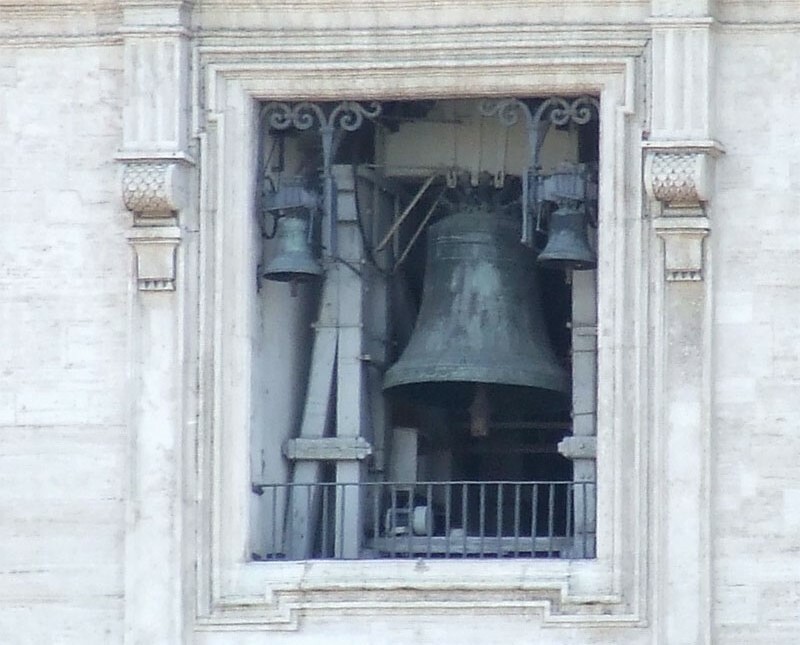 A 10 tonne bell – actually quite light as some tower bells go and, actually, an E3. We can only assume that Puccini wanted an E1 as an exaggeration. How do you replicate this in an orchestra? So far, the answer is, you don’t. At least, you don’t with a tubular bell. You might with a bell plate. But that’s for another blog. 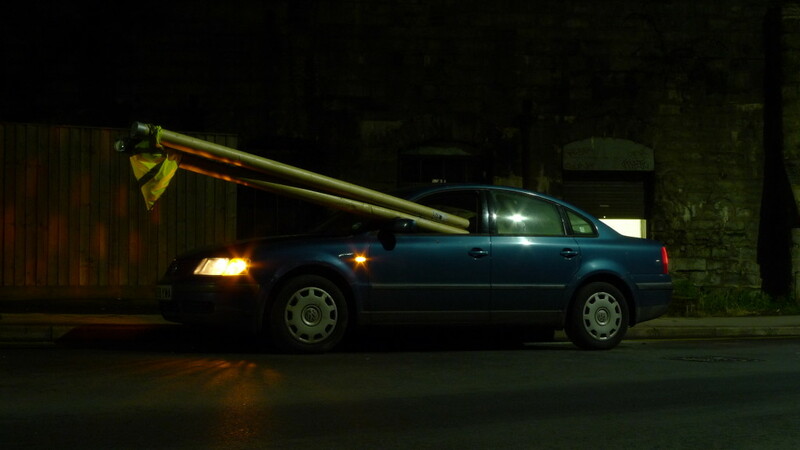 I believe there have been E2 tubular bells – i.e. 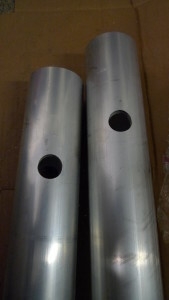 one octave up – made (by EQ Percussion and by Century Mallet) for use in Tosca, but I have neither seen nor heard them. They’ll be around 15 foot long 2″ chimes by my estimate. The overtone structure of tubular bells and the way your ears and brain assign pitch to such things really starts to fall apart below about Eb3 or D3, so there must be some tricks involved in making these work. So, I’m both relieved and disappointed in almost equal measure that I don’t have to figure out the tubular bells below D3 conundrum – yet. Evidently, the sheer size of the bells allow much more volume from the bass partials to get out into the air and thus to suggest the lower octave. Or, perhaps more likely, they are less prone to sounding an octave higher than they should, as deep tubular bells of lesser girth can sometimes do. Tubular bells fool you into hearing a virtual fundamental “1” by having three partials in their overtone spectrum which are approximately in the ratio 2:3:4 – so they seem like part of a harmonic series. Sometimes this auditory illusion can break down and you can hear the 2 and 4 as 1 and 2, or yet higher overtones point to a different pitch altogether. 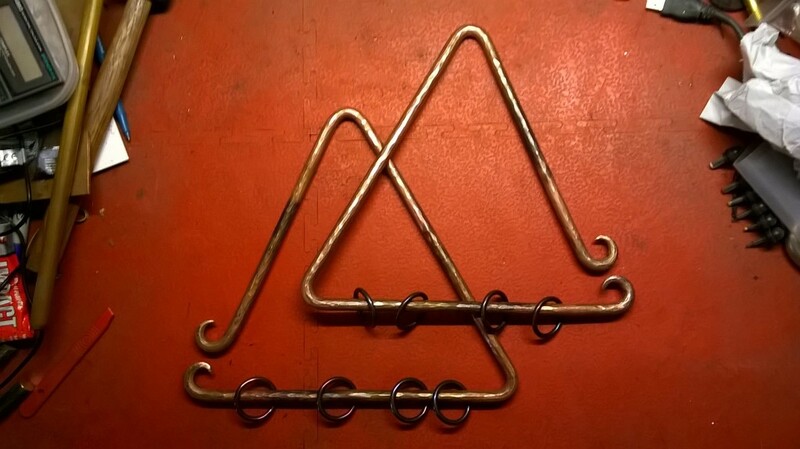 To make replacement tubular chime bells in Bronze, or even Brass would be extravagantly expensive today – not to mention back-breakingly heavy. 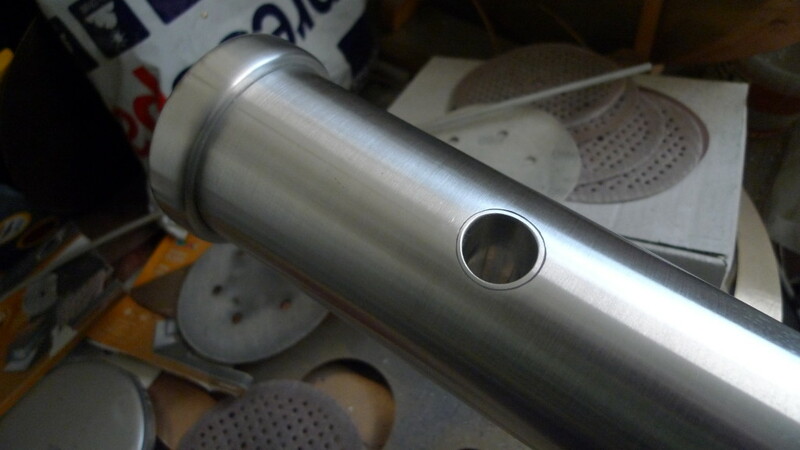 I have had success in making bass chimes using thick-wall Aluminium tubing. For this kind of thing, it ends up being quite a bit lighter, despite being up to 20% longer for the same note. The natural tendency for the Aluminium to damp the higher overtones also helps bolster the virtual pitch illusion. 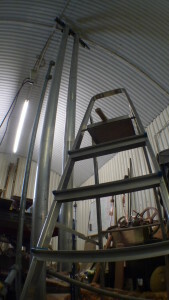 Let the adventures in 3 inch diameter Aluminium tubular bells begin! I wanted to use 3 inch outer diameter by 1/2 inch wall thickness Aluminium, the same cross section as the existing Bronze bells, but was not able to find any which could be supplied in time. So I went for 3/8 inch wall. Really, I would have liked to have been able to compare the two and decide which sounded better, rather than extrapolating from my experiments in 2 inch tubing. I ordered two 5 metre lengths. I couldn’t get them delivered directly to my workshop so had to transfer them from my home to there in my car. When I made my cymbal lathe, I made sure it was also capable of taking a standard metal-turning chuck. 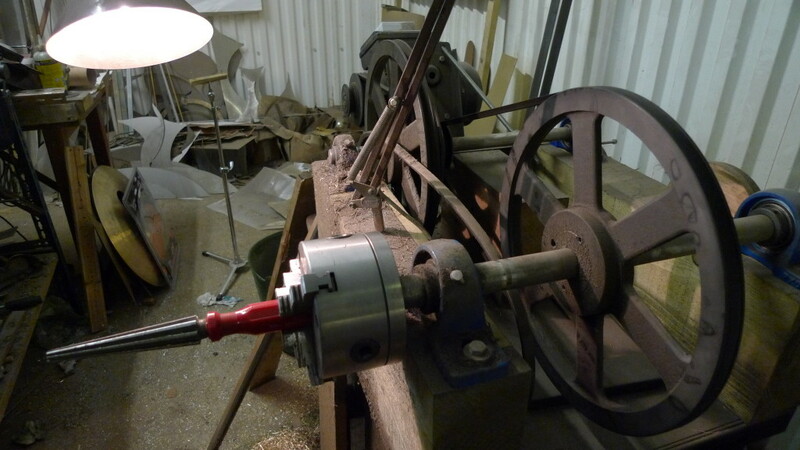 However, there isn’t a solid lathe bed or tool post, so some operations using this can be a little Heath-Robinson. Still, I can make nicely shaped caps and do the overall finishing of these (very) long tubes using this lathe. 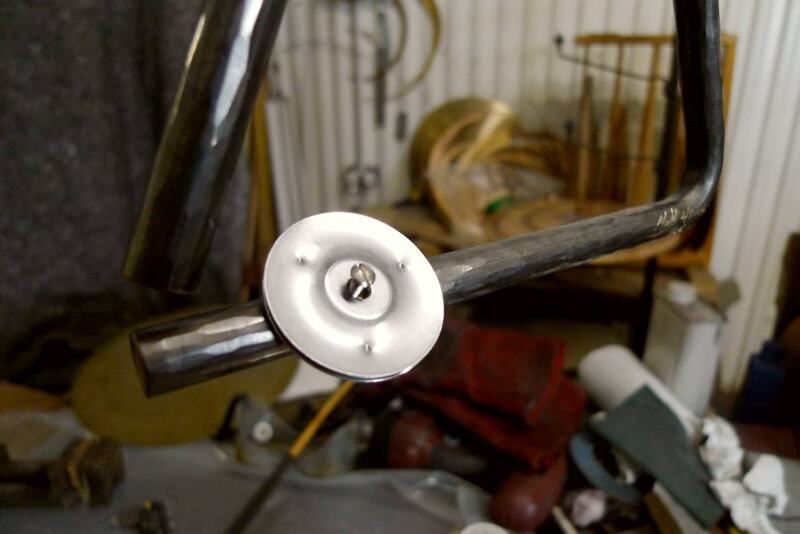 I like to fit cord guide tubes on my tubular bells. It makes life so much easier when threading the suspension cords through and it also helps the cords last a lot longer before they fray. For bells this big, that meant drilling some pretty big holes. A 1 inch hole saw was slightly too large (larger than advertised, in fact) and a 15/16 inch hole saw was slightly under what I needed. 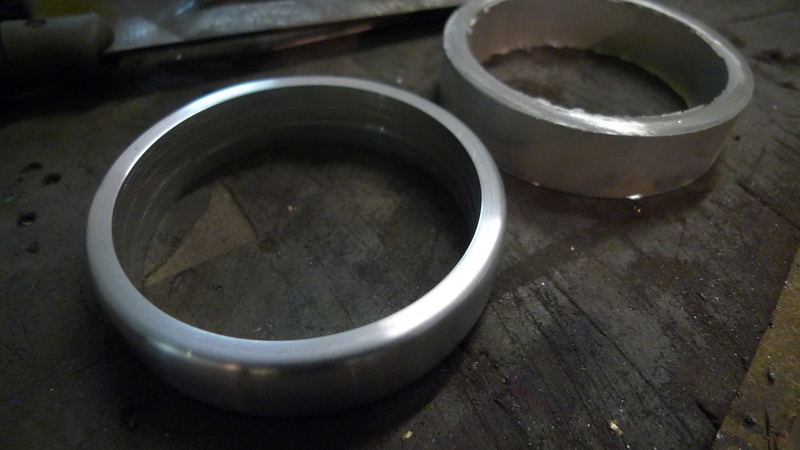 So, that lathe chuck came in handy again by allowing some power-reaming. While proper tubular bell tuning is more than simply cutting the tube to the right length, tuning the Bb was a breeze. After a little experimentation, everything fell into place nicely. The “4” overtone being only 4 cents out with the “2” being dead on. The “3” was a little flat, but not enough to upset anybody. The (approximate) minor 3rd and hum tones were quite loud giving plenty of body to the sound of the bell. The F, however, was more of a challenge and took the bulk of the time. It is easy enough with recording gear and computers to see exactly what is going on with the tuning of all the partials in a tubular bell. It is less easy to infer from this what the perceived pitch of the bell will be and, at notes significantly down on middle C (C4) like this, it can be hard to be objective about what you are actually hearing. Would the bell sound better 20 cents sharper? 20 cents flatter? 7 cents flatter? They all seemed reasonable and yet all a bit different, and different again in different contexts. After going dangerously far down a blind alley (finding a Bb partial in the F bell and matching it to a partial in the same octave in the Bb bell) I realised it was far easier to hear the apparent fundamental pitch of the bell when alternating between it and a reference, rather than listening to the two sounds at the same time. At last I have two bells which sound in tune and also good next to each other. They really are monsters at 2.8 and 3.2m long, but a fair bit more manageable weighing “only” 16 and 18kg. 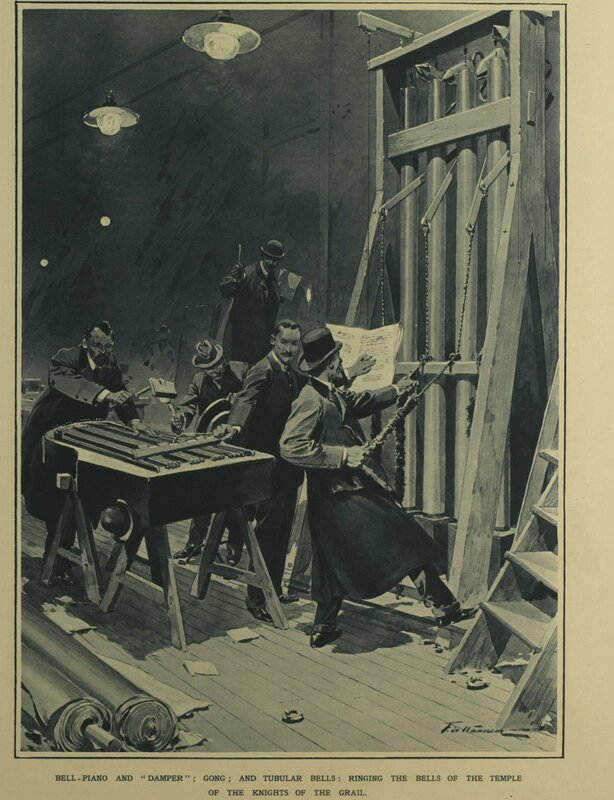 The Opera House has a specially constructed frame with built-in stairs and a platform for the elevated percussionist. Of course, it doesn’t fit in the pit, but that is fine as the bells are suppose to be “off stage” anyhow. 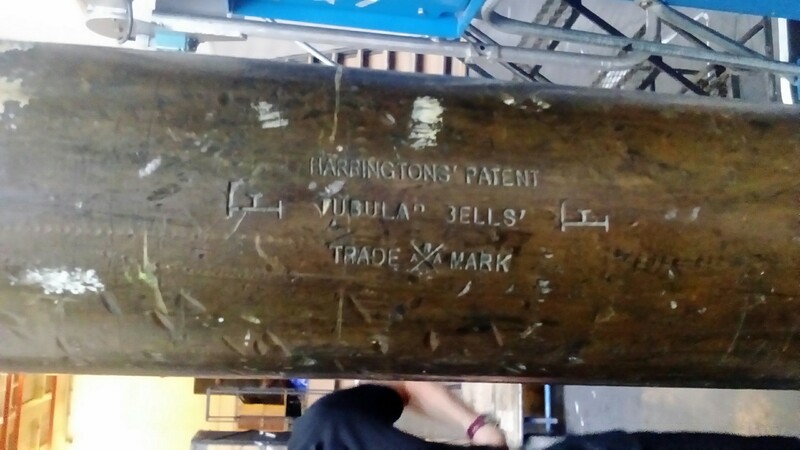 I hear that Maestro Pappone is happy with the sound of the new bells – such feedback is always nice to receive! 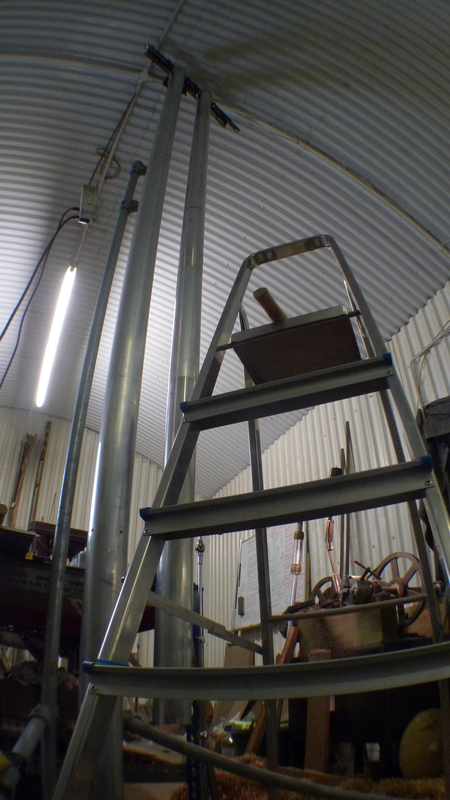 They just about fit in my workshop in the tallest part so I could test them properly. I thought I might have to move the lathe around 90 degrees to accommodate the F, but I got away with just pushing it back by 6 inches or so. If we need to replace the E bell at some point in the future, things may get a little more tight. The Quest for the Holy Grail? I can’t resist a good challenge. This one, seemingly, has remained unsolved for over a century. I am talking about the deep tolling “crystalline” bells of the Holy Grail temple in Richard Wagner’s opera, Parsifal. 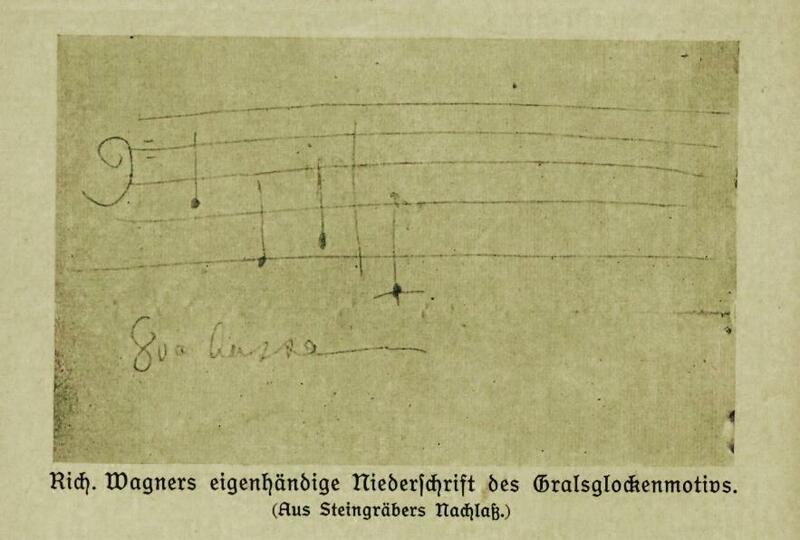 Wagner himself, was never quite satisfied with solutions to this sound he heard in his head. The lowest bell being 20 semitones below the deepest in St Stephen’s cathedral in Vienna. A real church bell like this would be larger and deeper than any ever made, as far as I know. The closest would be the great Kremlin Tsar Bell, which was never really finished and was damaged by fire in 1737. The low E would have to be 8 metres in diameter and over 260 tonnes! For the opera leitmotif you’d need 4, of similar proportions, to produce the C3, G2, A2, E2 peal. Real bells like this are, of course, out of the question. Too big, too heavy, too expensive and too loud. One of the earlier sonic solutions, which was rejected upon testing circa 1882, was a set of Chinese tam-tam gongs, sourced from London. To help the perception of a clear resounding pitch, a piano / hammered dulcimer hybrid was concocted. 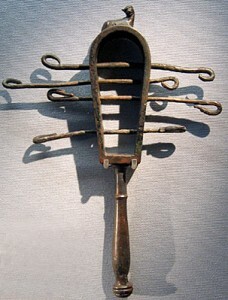 This had 6 parallel strings for each of the four notes and was struck with a wide mallet. You can hear a later version of it on the 1926 recording conducted by Karl Muck. 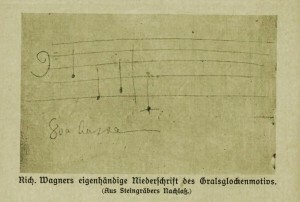 Steingraeber made various iterations of this Gralsklavier including a brand new one earlier this year. 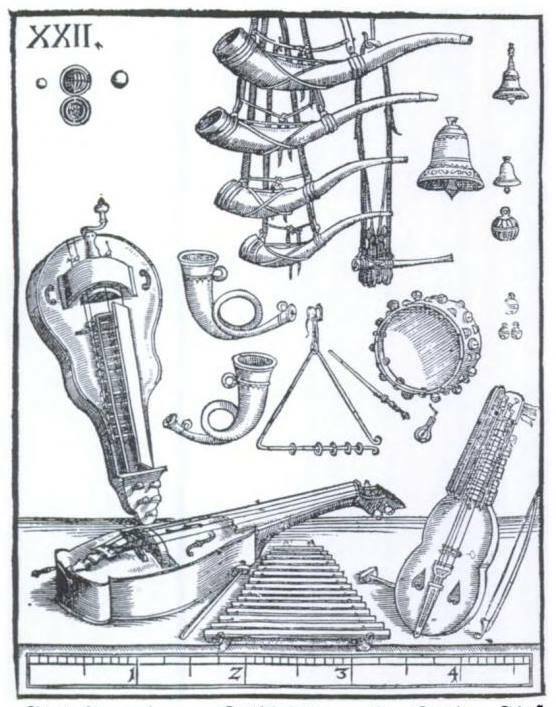 Here is the combination of instruments used by the Royal Opera at Covent Garden in 1914. Giant oversize tubular bells / chimes, a single gong (hiding there in the background, middle), and another of these piano dulcimer hybrids. Quite a wonderful newspaper drawing. I love the idea of playing percussion in hats and trench coats! Perhaps it was cold backstage. By far the most grand solution to add the metallic and somewhat discordant bell like tone plus some low end woof to the harmonious piano dulcimer was the set of brewing vat resonated bell plates constructed at Bayreuth. Absolutely huge and requiring one player each! You can also just about make these out in the Karl Muck recording. I can’t help but think that this solution was arrived at by trial and error rather than applying the techniques of Helmholtz from his 1863 paper “On the sensations of tone”. It wasn’t long before electronics were getting in on the act. Smaller, grandfather clock like, metal tines with pick-ups and amplification have been used. Manipulated recordings (or “samples”) of actual bells have been used. Synthesisers have been used – including for quite some time as a favourite, the Mixtur Trautonium, one of the very first synthesisers. 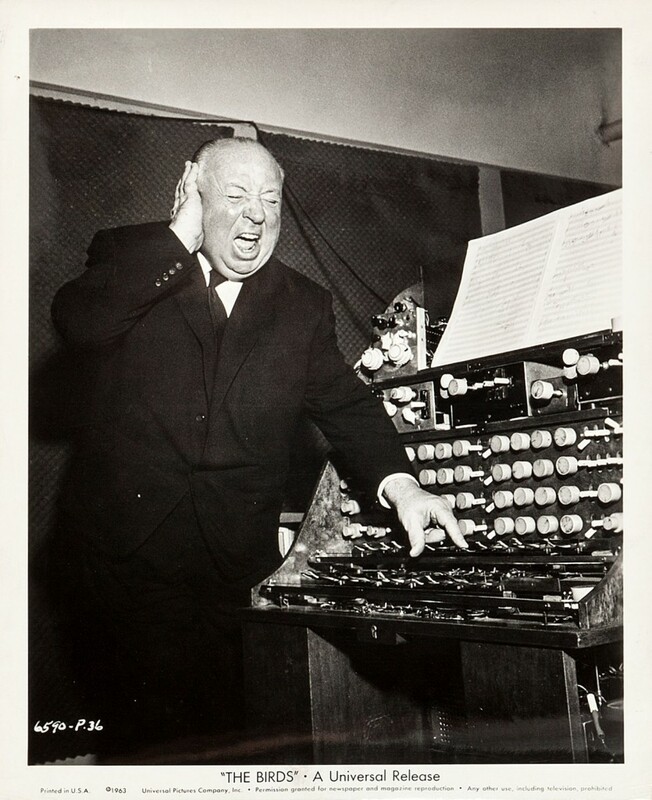 The latter was also a favourite of Alfred Hitchcock. He used it on the soundtrack to his film The Birds. And yet, anything electronic or amplified and played through loudspeakers always meets with disapproval from at least one corner or other. Even the (only slightly manipulated) recordings of the actual bells from St Sulpice in Paris as used this year for Berlioz’s Symphonie Fantastique at the Proms and the Edinburgh Festival got a drubbing in the review press. I can see why. When the rest of the orchestra is real, live, organic and full of human interpretation, expression and inflection, accompanying sounds which are not do rather stick out as alien interlopers. I’ve been meaning to get around to making some proper old-school triangles for quite some time. Did you know that the original incarnation of this instrument was gap-free and had loose jingling rings on the bottom limb? I’ve had a few requests from possible customers. 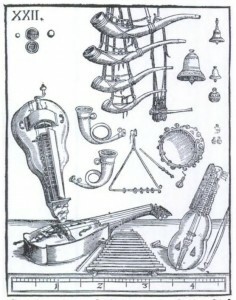 Period ensembles like to use instruments authentic to the time when the music was written – so that it sounds closer to the composer’s original aural vision. This either means using original / restored instruments or, more often than not, reproductions. The humble triangle (albeit often the instrument that makes other instruments sound better!) has murky roots. There seem to be different origin stories and, just perhaps, it might be possible that more than one of them is true. Did the triangle evolve from the Ancient Egyptian Sistrum, a ceremonial instrument? 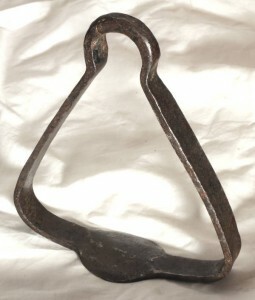 Or did it start out as rudimentary horse stirrups which were taken off the straps and used as folk instruments? There’s even an outsider suggestion of a hand-held metal device for making sparks from flints, the fire steel. Officially, the triangle entered the European Orchestra with the fashion for “Turkish” music in the late 1700s to early 1800s, this new section being called the “banda turca”. 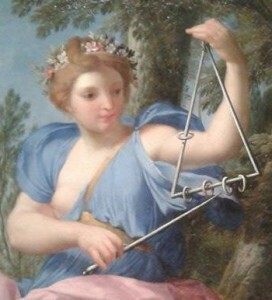 The triangle had existed in other musics in various places on the planet well before then. Though we only know this from paintings, drawings and wood carvings. I don’t know of any surviving instruments from those times. 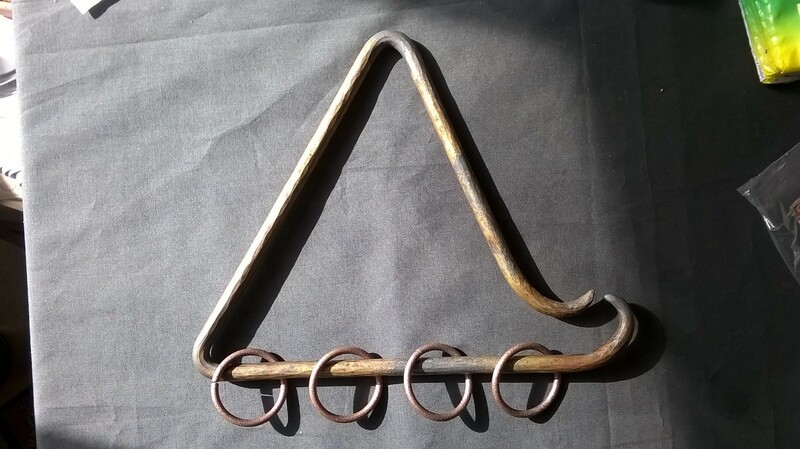 Today, these ancestors may be classified as early “mediaeval” triangles (closed, with rings, often quite tall and isosceles, sometimes even trapezoidal) or the later “baroque” triangles (open, with or without rings, often with scrolls fashioned into the open ends). Of course, nobody today really knows how the originals sounded, we can only guess. Then there’s the question of whether you go the whole hog into authentic materials, construction techniques and hopefully sound or do you make a halfway house. Somewhere between the guess of what the originals sounded like and the modern, open ended, ring-free triangle we are used to hearing now. As a maker, it fascinates me to wonder if there’s some secret buried back there waiting to be re-discovered. Last year I had a percussionist from an Austrian Orchestra after a “banda turca” triangle. He was disappointed with solutions he’d found elsewhere and wanted something with more sustaining and obvious sizzle – that you can still hear from a distance, through the texture of the orchestra. I had an idea about using cymbal rivets instead of rings and it certainly worked better than rings that pass through holes in the triangle limbs. Still not quite what was wanted though. 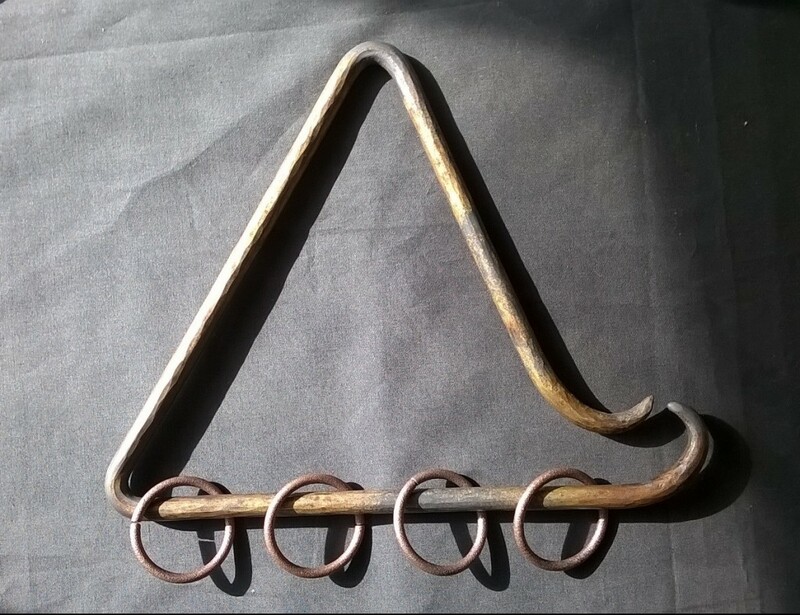 Then, we tried a pair of tambourine jingles on a small bolt, threaded into the triangle at an angle – perfect! So, we have a triangle that sings for a short – but not too short – time, accompanied by a clear jingling sizzling sussuration. So, not remotely authentic, but it made the sound the player wanted. This February, I had a different request. 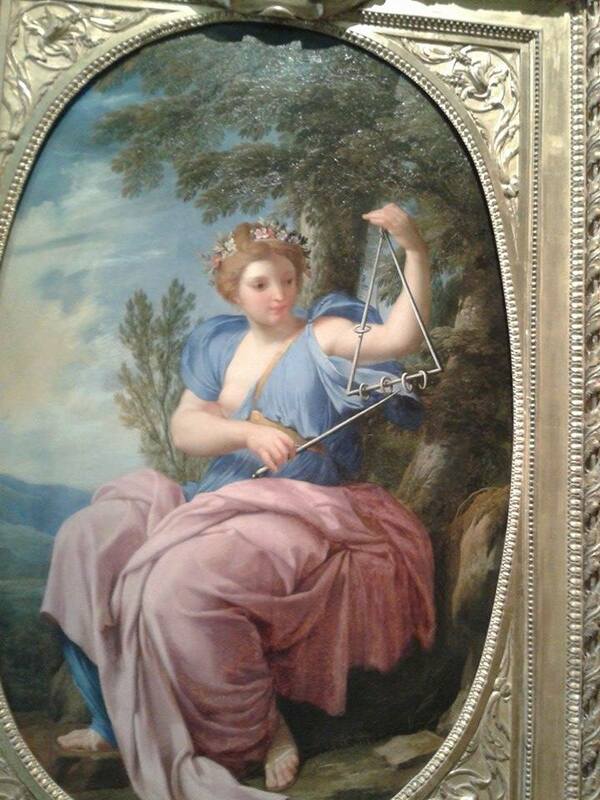 For a more authentic baroque style triangle, for Mozart. The suggestion was to have a slightly unorthodox scroll arrangement – both turning upwards. This was perfect for keeping the loose hanging rings from falling off the bottom limb though. The other alternative is to have the triangle gap small enough that the rings can’t get out unless you prise the bars apart. That has issues though, I think. Straight off the bat, this worked better than a rings-through-holes triangle. The rings are much more free to move, and thus they dampen the triangle less. There’s still a question to be answered regarding how many rings, of what material, what size and weight, etc. 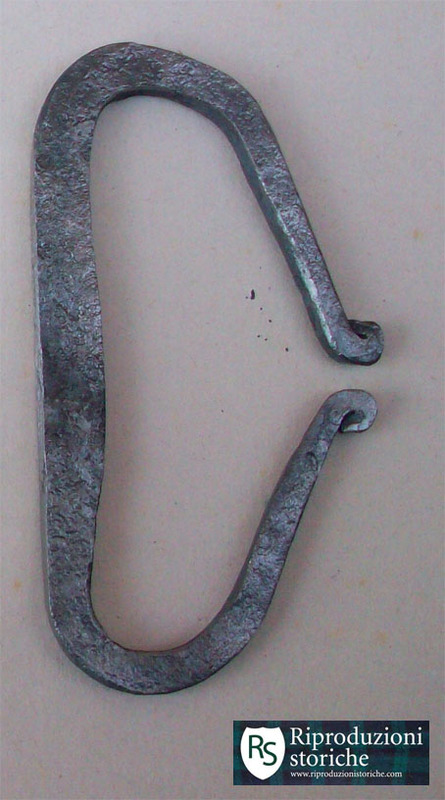 The originals would have been forged from iron by a blacksmith. For the triangle itself though, my client wanted one of my brighter sounding bronze alloys. Making small rings from this was somewhat out of the question, brass ones would be easy to make, but I don’t think they’d work too well. 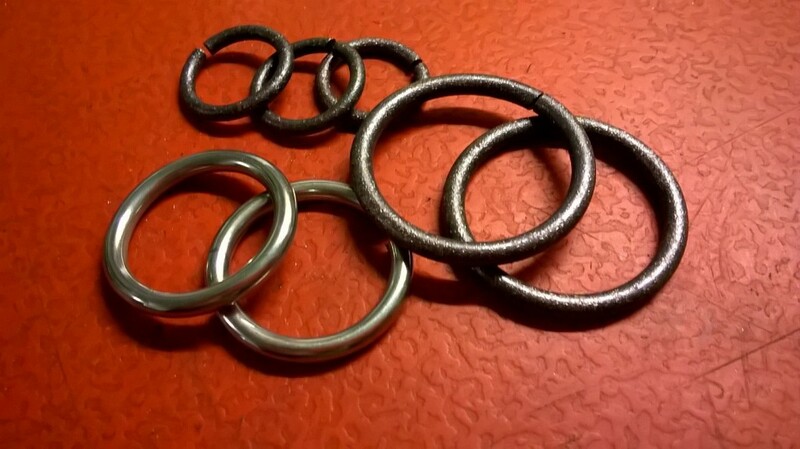 I found some wrought iron rings (for curtain poles!) – perhaps a little large, or maybe OK. Then also some stainless steel rings which were smaller and felt to be about the right size. As for mediaeval style triangles with all 3 corners closed (or 4 if a trapezoidal one), I’ve got to figure out some welding smarts for that one. Butted joint? Scarfe joint? Forge-welded or cheating modern methods? I think there may be some other subtle tricks too, to get an instrument that actually sings nicely. Tune in to a later blog to find out! I got better at making the scrolls. Here are some more recent editions of my triangle with the “blued” stainless steel rings.